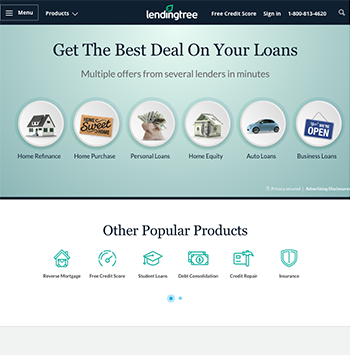 LendingTree is a free online marketplace that connects borrowers with good credit scores to interested lenders. LendingTree allows consumers to easily compare multiple loan offers from their extensive network of lending partners. LendingTree was founded in 1996 by Doug Lebda and Jamey Bennet, who decided there should be an easier way to receive the best loan rate by having lenders compete for the customers' business (instead of the other way around). The business was rebranded in 1998 as LendingTree and went public in 2000. Since then, they have helped fund over $251 billion in loans and helped secure over 55 million loan requests. Today, it is a free to use online loan marketplace that connects borrowers with good credit to trusted lending partners. LendingTree makes it easy for you by having banks compete for your business and cater to your needs. LendingTree's marketplace allows borrowers to easily compare multiple rates and terms for personal loans, auto loans, business loans, mortgages, student loans, and more. These unsecured loans ensure that you do not have to put up any collateral like your house, car, or savings. To see if you qualify, go to LendingTree's personal loans section and choose what type of loan you are in the market for, such as credit card consolidation, debt consolidation, home improvement, medical expenses, vacations, wedding expenses, and more. After you have done this, you fill out a request from, either online or by phone. You must answer questions regarding the loan amount you need, available down payment, debt-to-income ratio, loan purpose, credit rating, employment, whether you rent or own, and income. LendingTree requires that borrowers have a minimum credit score of 560, so they perform a soft pull on your credit score, which does not damage it. However, individual partner lenders may perform a credit check, either in the form of a soft credit check or a hard inquiry (which could take a few points off your credit score). Once the form is filled out, your information is sent to LendingTree's partners who look over your information and send loan offers that cater to you. They either contact you by phone or email. You are not obligated to accept any of these offers. LendingTree is a loan marketplace (not a direct lender) that allows borrowers to easily compare rates from eligible lenders. All offers can be seen on your LendingTree account dashboard, allowing you to talk it over with a professional before choosing if you want to accept any offers. You may also negotiate with lenders using some of the other loans and their terms. The full loan process generally takes less than a month. The APR (annual percentage rate) you receive from LendingTree's partners depends on your loan amount, loan terms, and credit score. The higher your credit score, the lower your interest rate. LendingTree's interest rates can range from 5.32% - 36% and loan amounts can range from $1,000 - $35,000. LendingTree provides a free comparison service for loans, but there may be origination fees and closing costs depending on the partner lender you choose. When you have selected your loan offer, you work directly with the lender to finalize the process until all parties agree to the loan terms. You will have to provide documentation to verify your employment and income, like your bank account information, pay stubs, and W-2s. You must work with your lender directly to determine your loan terms and when your funds arrive. LendingTree's value added perks include financial calculators and loan tutorials. Even after you choose your loan, they provide additional benefits by alerting you when a better deal becomes available for your credit profile, which allows you to decide if you want to refinance your loan. Their website also offers educational resources detailing loan types, financial advice, and reviews from customers about each lender. Helpful Customer Service: LendingTree's customer service department has positive reviews, with consumers citing that they were helpful and willing to answer any questions. However, they cannot answer questions about your specific lender. Bureau Reporting: Lenders in the LendingTree marketplace report to all three credit bureaus (Experian, Equifax, and TransUnion), which helps boost your credit score if you are diligent about paying on time. Credit Score Tracking: You can track your credit score for free if you have a LendingTree account. Additional Resources: LendingTree has extra resources like educational articles to help you make informed financial decisions. Online Calculator: Customers can use online calculators regarding personal loans, debt consolidation, mortgages, and more. App With Benefits: LendingTree has a highly rated free app for iOS and Android phones that allows you to check your credit score, apply for a loan, and look at your current loan status. LendingTree makes profit by selling your information to lenders that cater to your financial profile, which results in you being courted by multiple lenders through phone and email. Some consumers may find this to be too much, so an alternative is to use a different email than what you regularly use when you sign up so you are not bombarded with emails. LendingTree sells your information to matching lenders, which means that there is no way for you opt out of that if you want to find lenders through their online network. The APR offers you receive from LendingTree's network of partners are highly dependent on the lender that you choose, your credit score, the loan amount, loan terms, the length of the loan, and the area you live in. The minimum credit score required is 560. Your personal loan can range from $1,000 - $35,000. The APR ranges from 5.32% - 36%. Loan terms can range from 1 - 5 years. Receiving your funds can take 1 - 7 business days, depending on the lender you work with. There are no fees to use LendingTree's partner matching service, but LendingTree's partners may charge origination fees and closing costs. How does LendingTree compare to other lenders? LendingTree is unique in the fact that they cater to those with good credit and send them multiple loan offers from partner lenders across the country once they have applied. How do I know if I qualify for LendingTree's marketplace? Individuals who wish to be eligible for LendingTree must have a minimum credit score of 560. To find out if you qualify, you can create an account and provide basic financial information to check if you are eligible for loan offers from LendingTree’s partners.